Breast cancer is a disease caused by the formation of cancerous (malignant) cells that can occur within one or more breasts. According to some sources, breast cancer is believed to be the second most common type of this type of diseases. Amongst women, however, it far exceeds other forms of cancer, including cervical, as the most common cancer. Women are approximately 100 times more likely to develop this type of cancer than men; women are at higher risk primarily because of growth effects of female hormones such as estrogen. In addition, those age 55 and older are much more likely to develop this cancer than those under 55. Research indicates that about two-thirds of all breast cancers occur in individuals 55 and older. The most obvious and common symptom is a lump on the breast that feels different from the surrounding breast tissue. It is believed, according to studies done by Merck, that approximately 80% of all breast cancer cases are discovered as a lump by the individual. However, lumps can also be found not only in the breasts, but in the collar bone as well as the armpit. Warning: It is notable, that not all forms of breast cancer can be detectable by a sign or symptom during the initial stages. Periodic mammograms should be undergone by the patient as recommended by a physician. Once the tissue has been removed through a biopsy, it will be sent to a lab where it is examined through a microscope by a pathologist to determine if its cancerous. Fortunately, in more than half of all biopsies, the sample tissue is found to be benign (non-cancerous). If the tissue is cancerous, however, the next step that will be performed is to determine which stage the cancer is currently in. The treatment of breast cancer is dependant upon the condition of the patient i.e. whether the malignant cells have spread to other parts or is it localized to one breast or two breasts etc. Depending on the severity, treatments are suggested. The widely used treatments for this disease are given below. There are two types of surgical methods for treating this disease. 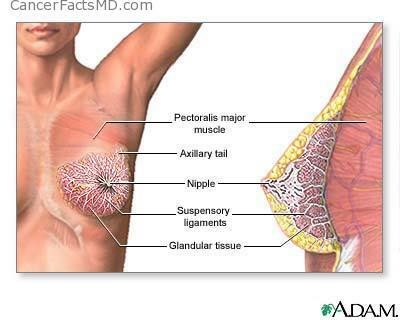 They are the Lumpectomy and Mastectomy. Lumpectomy is employed when there is just a lump or a small tumor and this is only a minor operation. This will not disfigure the breasts or there will not be any notable changes in the shape of the breasts nor will it have any after effects. Mastectomy is utilized if there are two or more lumps in the breasts and also if the tumors are larger than usual. In this surgery, the lumps are removed along with lymph nodes as well just to ensure that the cancer does not spread or resurface after the operation. This is probably another widely used technique to cure breast cancer and is not as invasive as the surgical treatment. This utilizes the services of X-rays or the gamma rays or any other rays which are capable of penetrating without any harm to destroy the cancerous cells. The treatment is very quick as it takes only around fifteen to twenty minutes for its completion. Some of the popular radiation therapies are Targeted breast cancer radiation therapy, accelerated partial breast irradiation etc. However, these methods are not as effective as the surgical methods because the survival rates of the patients treated with radiation therapy is not very convincing. Chemotherapy involves the use of certain drugs that inhibit the further growth of malignant cells and also destroying the malignant cells present. There are many types of chemotherapy and they are neoadjuvant, adjuvant and palliative chemotherapies. The popular drugs used for the chemotherapy treatment of breast cancer are tamoxifen, Herceptin, Aromatase inhibitors, Cyclophosphamide, Fluorouracil, Taxotere, Adriamycin etc. Other methods of treatment include hormone therapies, biological therapies, angiogenesis and antiangiogenic therapy.